Adidas F50 Adizero Black/Green: See the lightweight here. 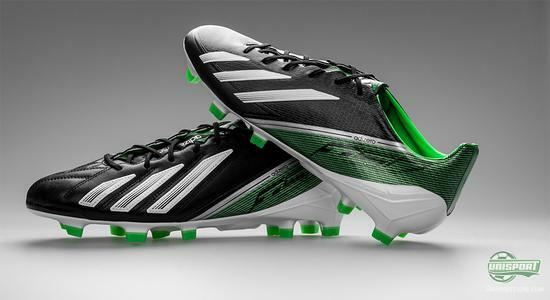 It can't be discussed, that the impact of the Adidas F50 Adizero on the boot market has been enormous, ever since the first time it stepped onto the field of play, back in 2010. Spearheaded by Lionel Messi, it's enjoyed great success and after the launch of the black and yellow colourway, the fourth generation is now also available in Black and green, as both a leather and microfibre boot. Lionel Messi has, for the last couple of weeks as the only player, stepped onto the Spanish, as well as the international, football pitches in the new, fourth generation of Adidas F50 Adizero. As he always does, he has chosen to wear the leather version, that can boast of having far more of the soft Goleo-leather on the upper, than it's predecessor. 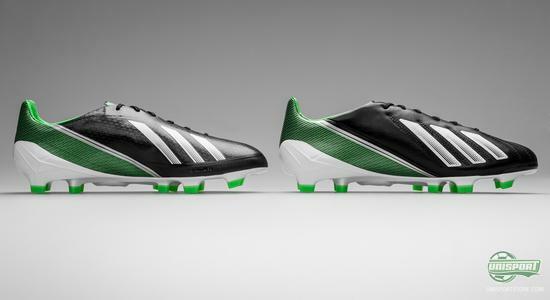 The Adizero will also be available in the ultra-light microfibre and we will now take a look at both variations. Jakob has already had the boot by for a premier, where he further elaborates on the new additions to the fourth generation of Adidas F50 Adizero. You can, among other things, hear about the new customisation of Sprintweb on the Microfibre-version and what the extra leather on the skin-model does for the boot. All this and much more can be seen in the video above. On the light microfibre-version, the focus has been entirely on keeping the weight down and they've definitely accomplished that; 165 grams is the impressive weigh-in. 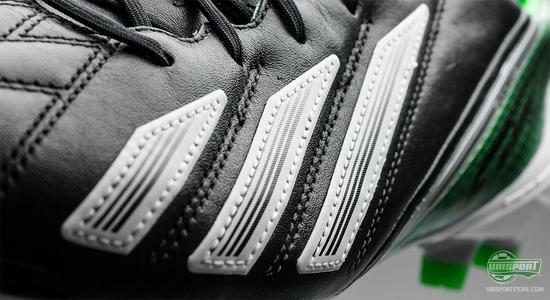 The upper has been given an update, but is still made from the AdiLite-microfibre, that goes hand in hand with the Adidas' Sprintweb-technology exceptionally well. 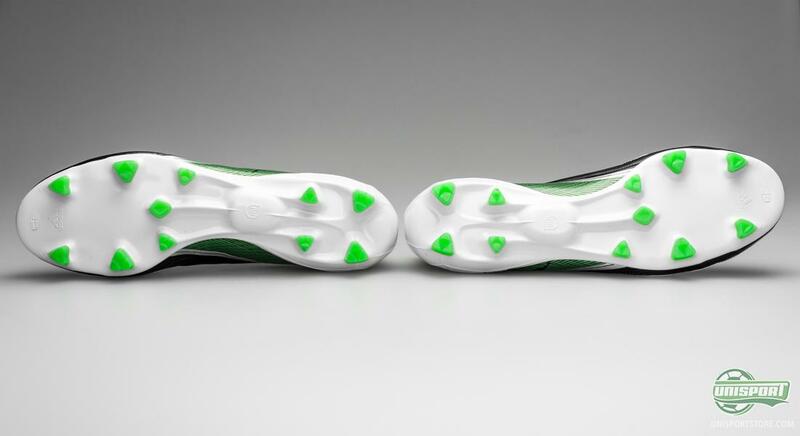 The three infamous and iconic stripes on the medial- and lateral-side of the boot, have been given 3D-texture, that gives increased grip in the ball and generally improves your already amazing touch on the ball, that's there as a result of the thin upper-material. 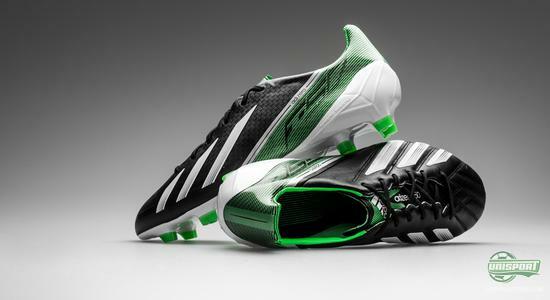 All of this is on top of the fact, that the stripes of Adi Dassler, also work as a part of the Sprintskin too. The leather-model has also been subject to some fairly drastic changes. The Sprintweb-cage from the older model has been removed, instead they have added more of the super nice Goleo-leather, that on the older version of the Adidas F50 Adizero, before only covered the nose of the boot. 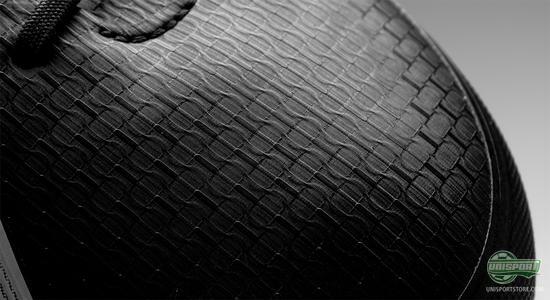 The extra leather on the boot, has added a few more grams and it now weighs 203 grams, which is still impressively light for a leather boot, which gives you the well known comfort, silky and soft touch, that comes with an upper that is made from a natural material, like leather. One thing they have in common is, that there on the heel has been implemented Adidas' Sprintweb-technology. 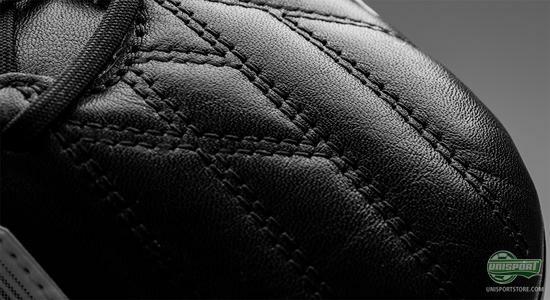 On the Microfibre-model it's also to be found on the nose of the boot and mid-foot, as the millimetre thin upper-material isn't strong enough to stabilise the foot and lock it in place without. 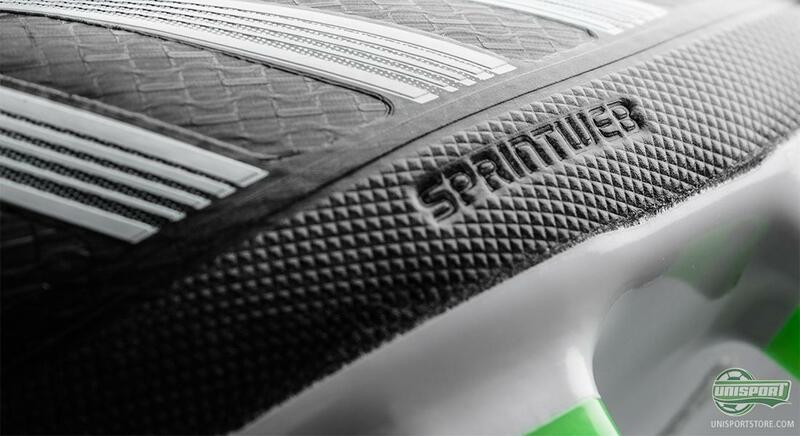 This has now been used on the heel-area , where the green band, wraps itself around your heel and keeps your foot in place, even when you reach your top speed. The leather-models upper is made from the sturdy and far stronger Goleo-leather however, so Adidas have adjudged the material to be strong enough in itself to support the foot. 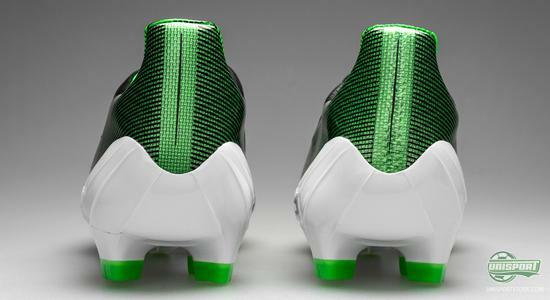 On the heel the boot still has the Sprintweb though, to give you this high-speed stability. As you can probably hear, the boot really encourages you to reach your top-speed. 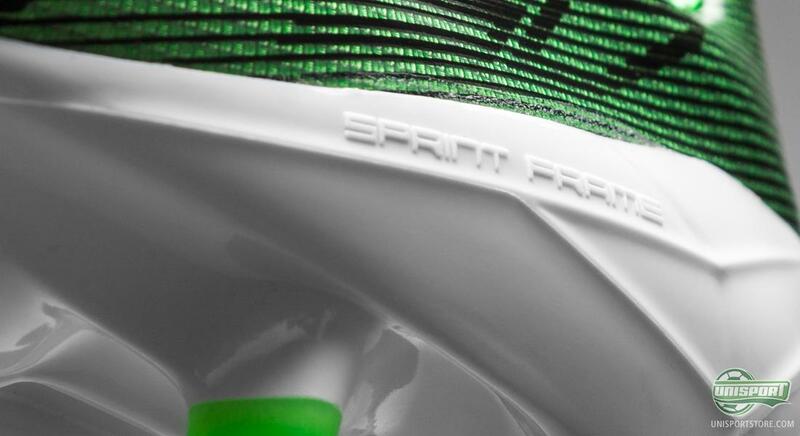 The sole is another part of the boot they have chosen to keep from the older incarnation and it's of course the familiar Sprintframe, that is tailored for speed and acceleration. Its external heel-cap gives the necessary support, stability and comfort to the back of the boot, while on some places at the front foot it's less than one millimetre thin. This is however not anything you notice particularly and you can thank the impressive construction for that. Both boots have the Traxion 2.0-studsystem in common, that is built up around the now iconic, triangular studs, that facilitate twisting and turning on tight areas, without compromising on acceleration and breaking. Furthermore there has been made room for Adidas' revolutionising miCoach-technology, that with a chip, allows you to collect data from games and training by measuring your average speed, number of sprints, total distance covered and much much more. 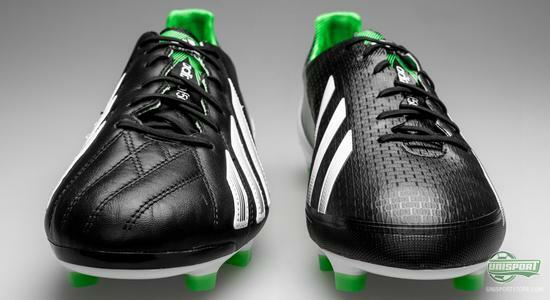 The new Adidas F50 Adizero Black/Green/White will get a rolling start and is expected to be backed up by several players, all around the world. 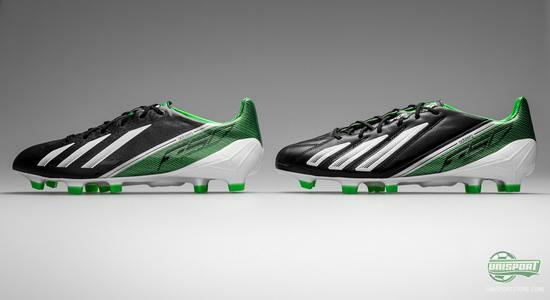 We are still completely torn; Which of the two boots is best? Microfibre? Or Leather? 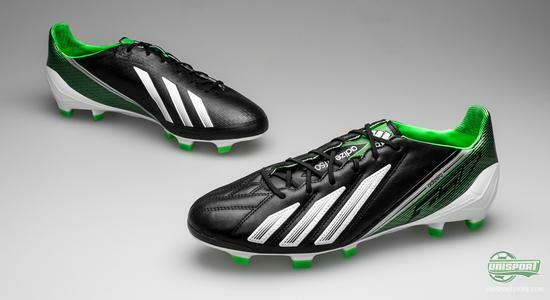 And what do you say to the darker colourway? Share your thoughts in the comment-section down bellow.